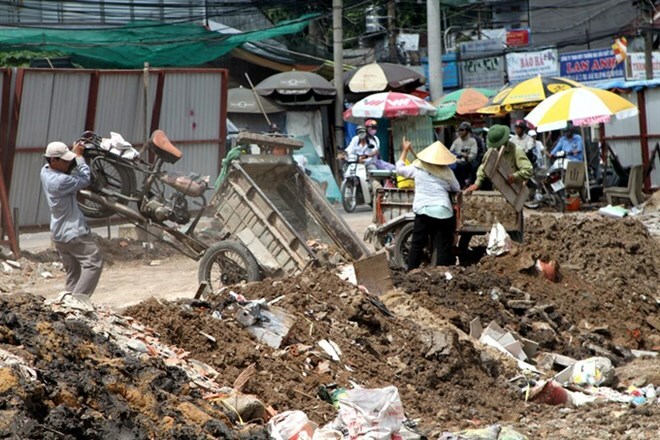 The People’s Committee of Ho Chi Minh City has submitted a solid-waste treatment plan to 2025 to the Ministry of Construction, which will seek approval from the Government. The plan calls for re-use and recycling of waste by using advanced waste treatment technologies instead of burying waste. Such advanced technologies will save land use and construction costs for new waste treatment facilities. The plan also identifies facilities and areas of potential operation to meet demand for the entire city. Covering 30,400sq.km with around 18 million people, the areas under the scheme border the provinces of Binh Duong, Dong Nai, Ba Ria – Vung Tau, Tay Ninh, Long An and Tien Giang. All of these areas discharge 9,000 to 9,500 tonnes of solid waste per day, including 7,500 to 8,000 tonnes a day from household activities, as well as 1,500 tonnes a day from construction works. The volume of solid waste from household activities has increased by 7 to 8 percent annually in these areas. Hazardous solid waste is around 150,000 tonnes per year, including 6,300 tonnes of hazardous healthcare waste per year. Around 7,200 to 7,500 tonnes of household waste, or over 90 percent of solid waste from households, are collected and transported to waste treatment complexes every day. However, the solid waste is not sorted, making it difficult for waste treatment facilities to recycle or re-use. Burying waste remains the main means of disposal, accounting for 75 percent of the city’s daily waste discharges. Fifteen percent of waste is treated with compost recycling technology and five to 10 percent with waste burning technology. HCM authorities said the high rate of waste burial poses risks to public health and to the environment. As the city has no large recycling plants, solid waste has to be purchased and sorted at nearly 1,000 small-scale and household facilities and recycled at 10 recycling plants. The city has two treatment complexes, the 614-ha Da Phuoc Complex in Binh Chanh district’s Da Phuoc commune and the Phuoc Hiep Complex in Cu Chi district’s Phuoc Hiep commune. City authorities have plans to reduce the area of the Phuoc Hiep Waste Treatment Complex from its current 687ha to 533ha. Two other complexes, 45-ha Dong Thanh Complex in Hoc Mon district and the 25-ha Go Cat Complex in Binh Chanh district, were closed in the past decade. Speaking at a meeting with a delegation from the People’s Council last week, Huynh Thi Lan Phuong, deputy director of the Vietnam Waste Solutions, a licensed Vietnamese corporation fully owned by California Waste Solutions, said the increase in waste volume treated at Da Phuoc Complex had exerted pressure on the plant. Around 3,000 to 5,000 tonnes are treated each day. In order to reduce the volume of waste treated at Da Phuoc, Vietnam Waste Solutions will invest in another waste-burning plant which can treat 1,500 tonnes of waste per day, Phuong said. The treated waste will be used to make by-products such as electric power, VNG gas, compost and organic fertiliser.